Feasting on the Word Guide to Children's Sermons equips church leaders and children's ministry volunteers to deliver children's sermons that are free of gimmicks and simplistic conclusions, that welcome children into the family of faith, and that give a foundation in God's good news for all people. This volume will address the common questions pastors have about the children's sermon, steps on avoiding common pitfalls, suggestions on how to use the children's time in a church following the lectionary, and sample Bible stories for use in the children's time. "I encourage you to pick this book up and take a journey with the authors as they break open new and exciting ways we offer our Holy Scriptures to children and to all who listen with them." 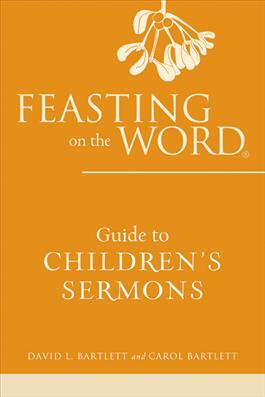 "This, thankfully, is not the usual book on children's sermons. If you are looking for the customary collection of gimmicks, object lessons, and little moralisms that characterize this genre, this is not the book for you. Instead, the Bartletts present a vision of preaching to children that leads to faithful and contextually pertinent sermons—attentive to biblical texts, alert to what it means for children actually to worship, and expressive of the gospel. They challenge us to create sermons for children that are as carefully crafted and theologically profound as all sermons are supposed to be. In short, they call us to care about the children to whom we preach and the gospel we are commissioned to preach. If this book keeps even one preacher somewhere from grabbing a paper bag and a doll on the way out of her study or fastening on a fake beard and telling the children that he is James the son of Zebedee, the Bartletts will have accomplished their purpose." "From the first chapter to the last story, this is a valuable resource for anyone who is responsible for the children's time or sermon in worship. The Bartletts take this activity seriously as a theological and liturgical enterprise, but they also understand its place as a hospitable practice towards children (and adults, for who doesn't enjoy a well-told story). Follow their lead and this element of worship will be transformed for everyone." "The Bartletts bring a wealth of knowledge and experience to addressing the perennial question of children's place in worship. Their desire to keep the biblical story of Good News at the center of the lives of all God's children, but especially the youngest disciples, is where the church's focus should be. Pastors, Educators, and all those who love children will find help and encouragement in these pages to tell the stories of faith as Jesus did."